My Go-To Winter Look with Scala Hats & Bearpaw! Today I am sharing my favorite go-to look for the winter season! I am all about comfort but I still like being stylish and cute. So what I do is I wear either my soft and stretchy Levi's or leggings. I know, I know, leggings are not supposed to be worn as pants (lol) but I wear the ones that are very thick lined and NOT see through. I usually pair it with a chunky knit oversized sweater, some cute boots, and a stylish accessory. For this look I wore a simple pair of black leggings, Bearpaw boots, a chunky turtleneck, and my new favorite hat from Scala! 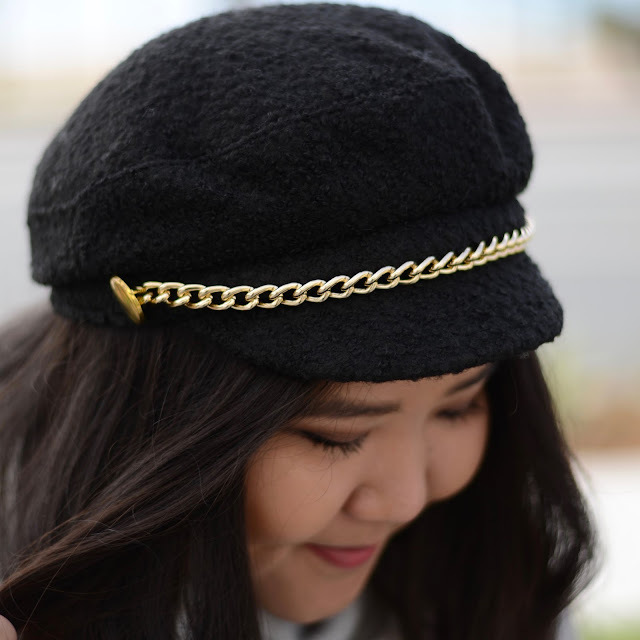 This hat is a newboy style hat with a golden chain across the front of it. I think that the chain gives the hat such a unique and sophisticated look. I paired it with a gray chunky knit turtleneck and my favorite furry boots. I posted a full outfit look down below as well as a couple close-ups. Altogether, I feel like this look blended perfectly together. I got so many compliments on my hat! It is definitely my new favorite. I hope you enjoyed this look! Be sure to follow me on Instagram to get the inside scoop on my latest posts. I received the hat complimentary as a road-test sample. Follow Brittney's board S U M M E R.F A S H I O N on Pinterest.